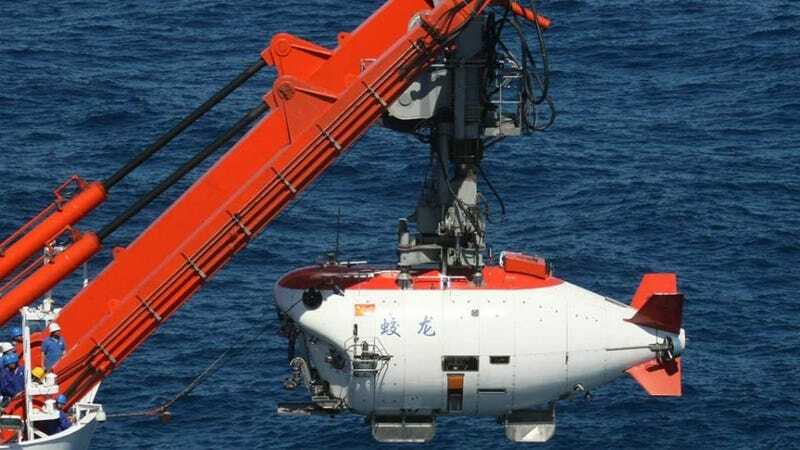 While it may not be able to reach the same seven-mile mark as James Cameron's deep-sea vessel, the Jiaolong manned submersible could provide so much more. The Jiaolong is an 8.2-meter long, 22-ton scientific research vessel and the result of years of stealth development by the Chinese government. It was initially devised as part of the 863 Plan, a high-tech R&D initiative enacted in 2002. The Jiaolong made its first test-run in 2010, diving to 3000 meters. A subsequent test in 2011 saw the sub dive past 5000 meters, making it one of only five submersibles in the world capable of exceeding 3500 meters—the others belonging to the US, France, Russia and Japan. Tang Jialing, Fu Wentao and Ye Cong comprise the submersible's three-man crew. Ye both helped design the vessel and has been its pilot on 28 of the previous 37 dives. If the sub does reach its operational limit of 7000 meters during an upcoming test-dive in June, the Jialong will become the only sub of the five capable of diving beyond 6500 meters. At 7km below the surface, the Jiaolong will have access to 99.8 percent of the seafloor—assuming it can withstand the crushing pressure. With that sort of range, the Jiaolong will play an essential role in deep-sea exploration, both scientific and commercial. The company that helped design and build the submersible, the China Ocean Mineral Resources R&D Association (COMRA) has contracts with the International Seabed Authority to photgraph and survey 75,000km swaths of the seabed in return for rights to "explore minerals and other resources for commercial purposes in this area once the technology matures," said Jin Jiancai, COMRA's secretary-general.